Heart disease during pregnancy is more common than you think and researchers have found one very important factor in determining your odds of suffering from it. 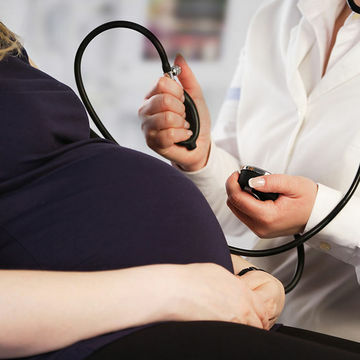 When we think of pregnancy complications, heart disease isn't often on the list of things we really worry about—but as it turns out, heart disease strikes women during pregnancy with alarming frequency. According to a University of Pennsylvania study, 1 in 1,000 pregnant women will deal with peripartum cardiomyopathy, which can occur in the final month of pregnancy and weakens the heart muscle. Unfortunately, you're not out of the clear once you've delivered: It can strike up to five months postpartum. We didn't have much information about the cause of this disease—but it looks we do now, thanks to the study. Which is good news, since this complication can cause serious issues. The bad news? It looks like there's not much you can do to reduce your risk of it. Researchers attribute peripartum cardiomyopathy to a genetic defect. "Until now, we had very little insight into the cause of peripartum cardiomyopathy," the study's senior author, Zoltan Arany, M.D., Ph.D., an associate professor of cardiovascular medicine, said in the study's release. "There had been theories that it was linked to a viral infection, or paternal genes attacking the mother's circulatory system, or just the stresses of pregnancy. However, this research shows that a mutation in the TTN gene is the cause of a significant number of peripartum cardiomyopathies, even in women without a family history of the disease." The team of researchers studied 172 women, looking at 43 genes to come to this conclusion. A whopping 15 percent of the group had genetic mutations, which usually showed up in the TTN gene, where instructions for making TTN protein are made. Sounds confusing? Here's what you need to know about this particular protein: It's called the Titan protein, a name inspired by the Greek gods. This protein affects the heart's ability to contract and relax—so it makes sense that this just might be the linchpin in determining your risk of the heart defect. Of the women studied in this particular case, 26 exhibited mutations on the TTN gene. According to the study, this outranks all other reported causes of peripartum cardiomyopathy. These same mutations also can cause dilated cardiomyopathy, which decreases the heart's ability to pump blood. These two conditions don't necessarily go hand in hand, though—one can experience one complication without the other. "These findings will certainly inform future peripartum cardiomyopathy research, with possible implications on genetic testing and preventive care. Though, more research is unquestionably needed. We're continuing to follow these women and we're gathering data for hundreds of others around the world, with the goal of identifying the cause of peripartum cardiomyopathy in the remaining 85 percent of women with this condition, and ultimately using what we learn to improve the care of these women and their newborns," Dr. Arany said.